The second biggest investor in Arsenal, Alisher Usmanov, says he is "not holding any talks" with majority shareholder Stan Kroenke about selling his stake in the club. It has been reported that Kroenke, who owns 67% of the shares, has made a bid to buy out Usmanov's 30% stake. 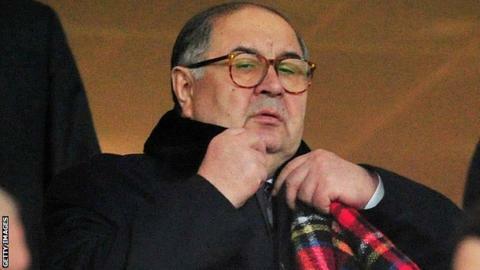 However, Usmanov, 64, said his interest in Arsenal is "long term". "I see my 30% stake as an important aspect in protecting the best interests of the fans in the club," he said. Despite being a shareholder, Usmanov is not part of the board or the decision-making at Arsenal, and has previously criticised Kroenke for Arsenal's failings on the pitch. The Uzbek made a £1bn bid in May to take control of the club, but it was rejected by Kroenke. "My interest in Arsenal from the beginning was long term and my intention has always been to buy additional shares should they become available," Usmanov said. "I would like to assure supporters that I am open to various future scenarios - a constructive partnership with the majority shareholder, the purchase of his stake either alone or in a consortium, or if a party appears who shares my and undoubtedly the majority of fans' vision for the club, I could consider the question of selling my stake." The metal magnate bought his first shares at Arsenal in August 2007, while Kroenke took majority control of the club in 2008.